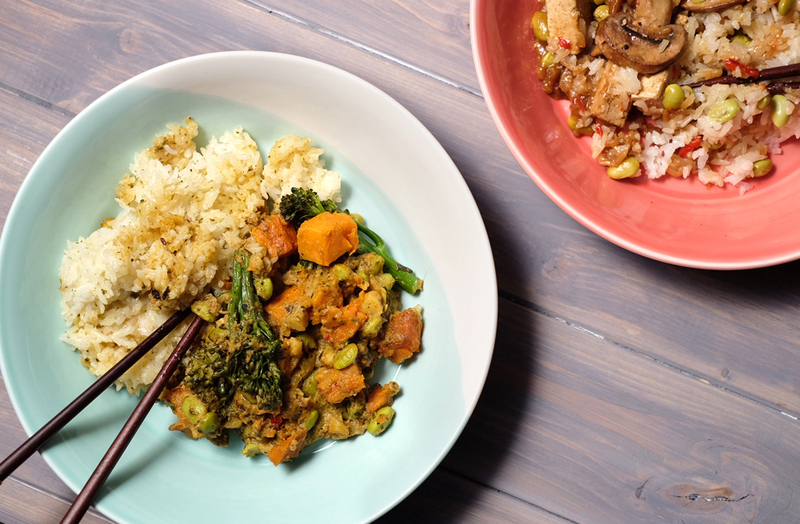 It’s been just over a month since M&S launched their fully plant-based, vegan-friendly Plant Kitchen range, and a month of me cooking and tasting some of its awesome products. Now I’m finally ready to share my honest, genuine opinions with you all! First though, let’s talk a little more about Plant Kitchen, and why it’s been a huge deal for vegans everywhere. M&S Plant Kitchen range – what’s it all about? Chock-full with ready meals, meat alternatives, hearty comfort foods and lunches on the go, it seems Plant Kitchen really has thought of everything. Which makes total sense, when you learn that M&S enlisted none other than a team of expert chefs and product developers to create the range. Plant Kitchen covers over 60 meals and food choices, reflecting M&S’ dedication to making plant-based eating a more accessible, delicious way of life for everybody. It’s also just another reminder that the vegan movement is growing more than most people realise, with M&S being just one of many retailers to introduce vegan options in January along with Greggs, Pizza Hut and even TGI Friday’s. Now I’m not saying that buying vegan fast food and ready meals is the most cost-effective or healthiest way of eating – it definitely isn’t. Only home-cooked, whole plant foods will reduce your food bill and put you in the best shape of your life. But having these options on our high streets certainly makes plant-based eating so much easier, as well as more exciting. From burgers to pizzas, stews to curries…M&S’ Plant Kitchen products are yet another amazing addition, giving so many more options to busy vegans or simply those who are curious about eating more plant-based food. When M&S asked if I’d like to review some of the Plant Kitchen products, I naturally jumped at the chance. While I wouldn’t normally include these kinds of products in my regular grocery shop, I’m keen to show just how delicious and satisfying a vegan diet can be, especially to those who still think vegans only eat salad (yup, they exist). There are, of course, plenty more delicious, mouthwatering dishes in the range, which are listed at the end of this post. 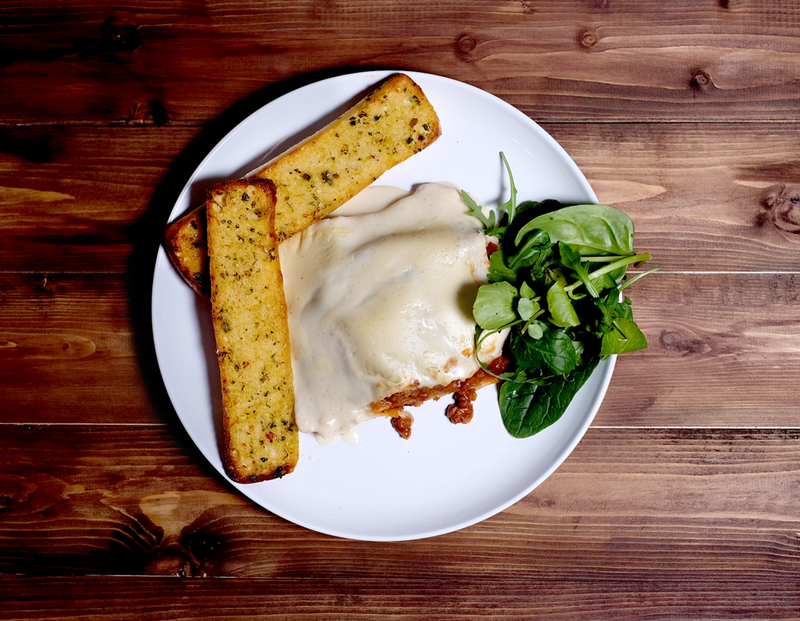 This particular lasagne from M&S ticks all of the boxes. 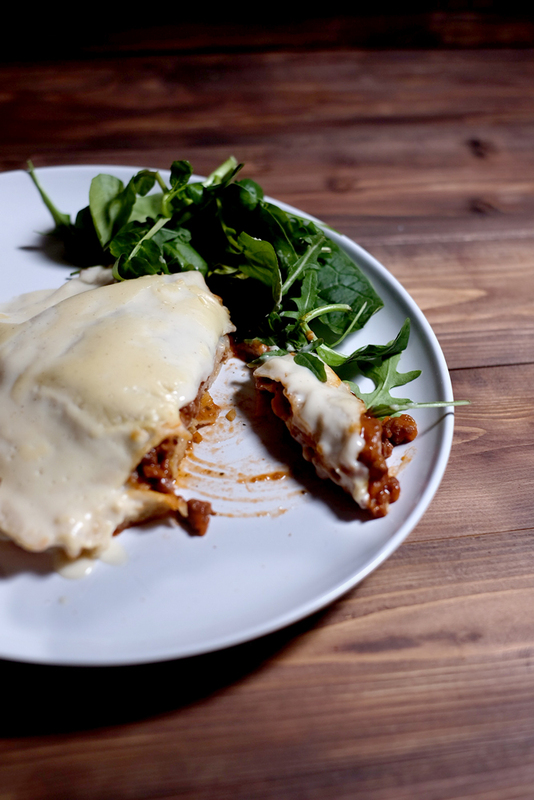 Using tender soy mince and a rich Italian tomato sauce as the base, it provides all the taste and texture one would want from a traditional lasagne, with much less saturated fat and none of the cholesterol. The béchamel sauce was surprisingly great too – rich and creamy, with no ‘fake’ taste about it as can often be the case for many vegan dairy alternatives. Instead of using a plastic-tasting vegan cheddar for the topping, it uses more of the creamy white sauce, which has just right hint of cheesiness without being overpowering. The soft pasta sheets and juicy tomatoes ensured this dish was bursting with flavour and richness, and my boyfriend (who is usually averse to veg-based lasagnes) loved every bit of it. This is one Plant Kitchen product I believe is well worth the money, as you get a decent portion that’s rich and satisfying. It’s also perfect for omnivores too, as the hearty soy ragu keeps it from tasting like your average veggie dish. We served it with some vegan garlic bread and a green salad. I always thought M&S did a great ‘chicken’ nugget as part of their normal veggie range, way before the Plant Kitchen range came out. 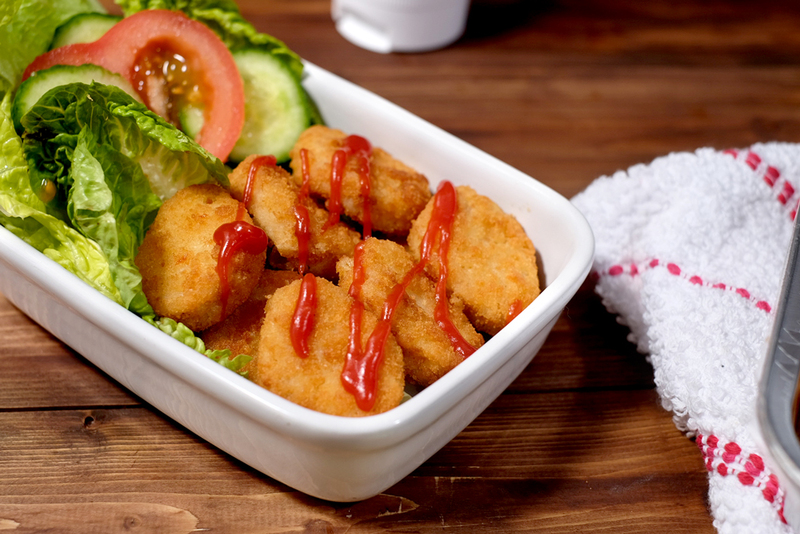 Thankfully, it doesn’t seem like they’ve made any noticeable changes to these nuggets – just a simple rebrand to make them part of the Plant Kitchen range. The result is now a more clearly labelled ‘chicken’ nugget, that both vegans and vegetarians can enjoy. And enjoy we did! With a crispy, gluten-free crumb coating on the outside, and tender, flavourful soy protein on the inside, they taste every bit like the chicken nuggets I enjoyed when I was a kid, but with none of the cruelty. Enjoyed with fries or dunked into ketchup, these babies are a real treat. My only complaint is that the box only includes eight nuggets and it’s supposed to serve two people. That means just four nuggets each!! I am not sure where M&S are getting their portion sizes from, but let’s just say, I think we all need more than four nuggets per person in our lives. Am I right??! Besides the fun play on words here, I really enjoyed these vegan, meat-free sausages! Both the taste and the texture are what you’d expect from any classic pork sausage, meaning these sausages would be great on a BBQ, on hotdogs, in pasta, on sandwiches, or part of any veggie fry-up. 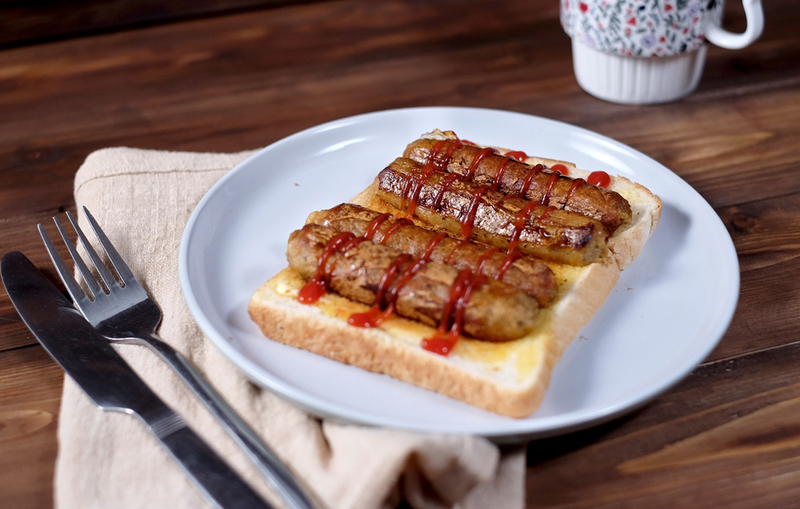 Though I can’t say they beat my favourite Linda McCartney sausages, I’d definitely place them as a close second as far as store-bought, meat-textured sausages are concerned. Both Christian and I approved of them and enjoyed them both on toast and in pitta breads with lots of salad and ketchup. One more thing I will mention about these sausages is that their main ingredient is soy protein isolate. While soy in general is certainly not bad for you, this highly refined variant of soy has been found to have negative health effects when consumed in excess. It’s for this reason I’d suggest saving these sausages only as an occasional treat, or look for an alternative vegan sausage that doesn’t contain soy protein isolate, like Linda McCartney’s. I wasn’t really aware of it before, but ‘dirty’ fries are becoming a thing these days, particularly in expensive burger joints where the aim seems to be to make everything as indulgent as possible. Needless to say, these fries are normally far from vegan-friendly, as they are coated in everything from bacon to cheese to mayonnaise. 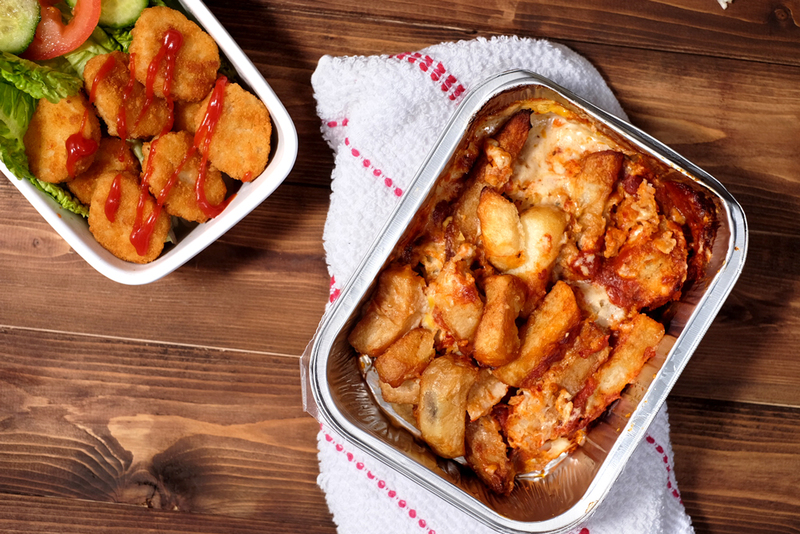 But thanks to M&S, vegans can now enjoy their own version of this junk food dish, and in the comfort of their own home too! 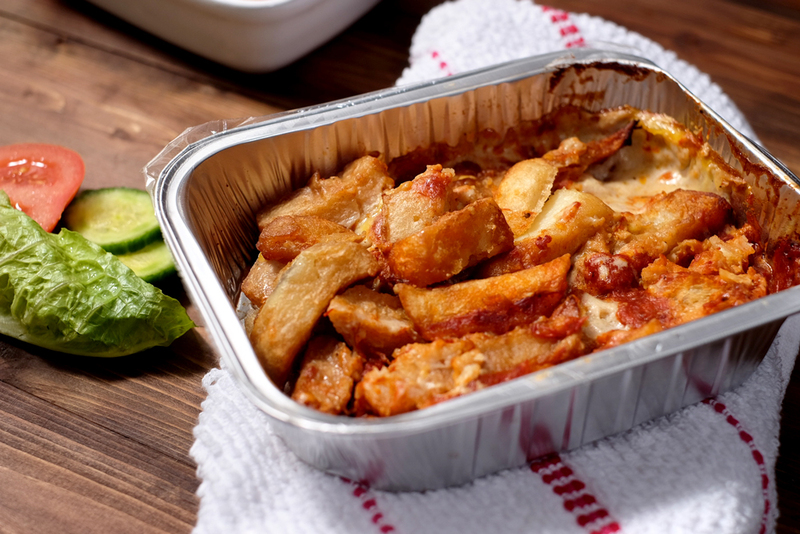 These thick, chunky, warming chips are nestled within a rich, juicy tomato and creamy béchamel sauce, before being baked and emerging crisp and bubbling from your oven. It’s not a combo I ever would have thought about trying before, but damn, it WORKS. I just could not get over how delicious and rich these flavours were, it was incredible. Like with the lasagne, the béchamel is rich and creamy and tastes just like how I remember it from my omnivore days. The box serves two, which I actually found to be just about right for Christian and me. However I’m not going to lie and say I couldn’t have eaten the entire thing! The Teriyaki Tofu is one of the more ‘ready meal’-type dishes in the Plant Kitchen range, ideal for when you need a quick and speedy supper. 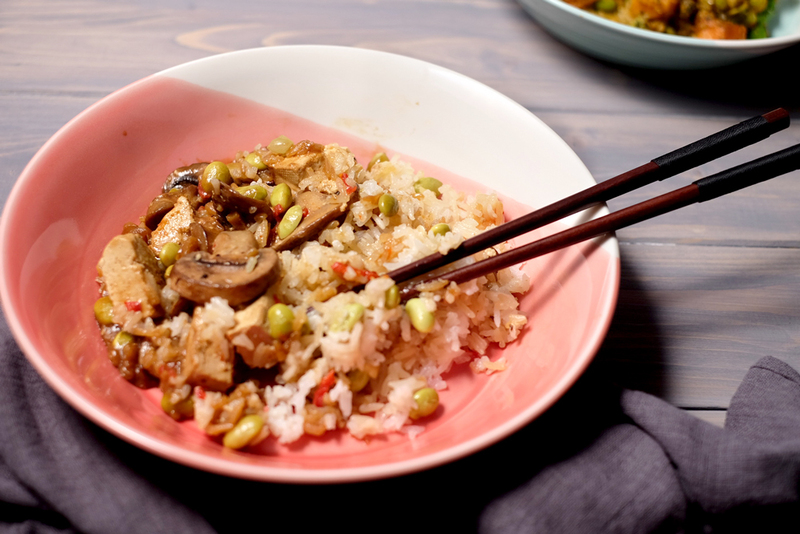 I did really enjoy the zingy, sweet flavours of this Asian-inspired dish. The sauce was bright, sweet and slightly spicy, and there were plenty of tofu and mushrooms packed in. However, as a whole it was probably my least favourite dish of the bunch, for a few reasons. Secondly, the portion size is very small, so it didn’t fill me up, and it also uses white rice, which also isn’t going to be as filling as brown. The ready meals are also not meant for freezing, which is something I didn’t realise so I ended up doing exactly that. Though I don’t think it changed the flavour of the food in any way, I do think maybe that’s why it didn’t look quite as photogenic as it could have. On the whole I think the Teriyaki Tofu was a great idea, but I’m pretty sure something similar could be easily whipped up in your kitchen, without the unnecessary oil and sodium. This one was probably my favourite of the two ready meal dishes I received. The green thai curry sauce was rich, aromatic and coconutty, and had just the right amount of heat (though any more and it may have been too spicy for me). The curry is definitely a perfect warming treat for those cold nights when you might get home late and just don’t feel like cooking. 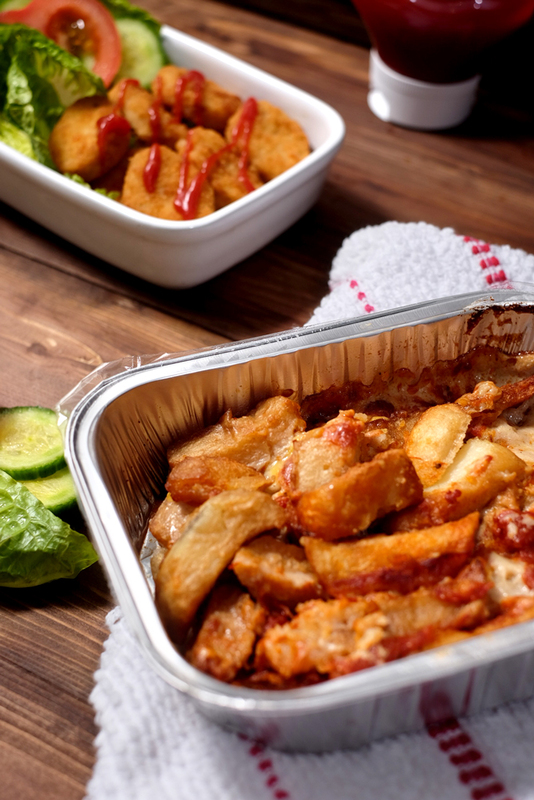 However, it carries the same issue as the Teriyaki Tofu, in that it mixes together in the box and ends up a bit messy, and that the portion is also very modest, so you may not feel completely full afterwards. Perhaps M&S could think about creating separate compartments for the rice and the sauce; that way everything would stay nice and separated. Of course however this didn’t impact the flavour in any way and it was still a tasty meal. Being a huge fan of jackfruit, pizza and all things BBQ, I was probably most excited to try this pizza. And thankfully, I was not disappointed! So first thing’s first – the base. 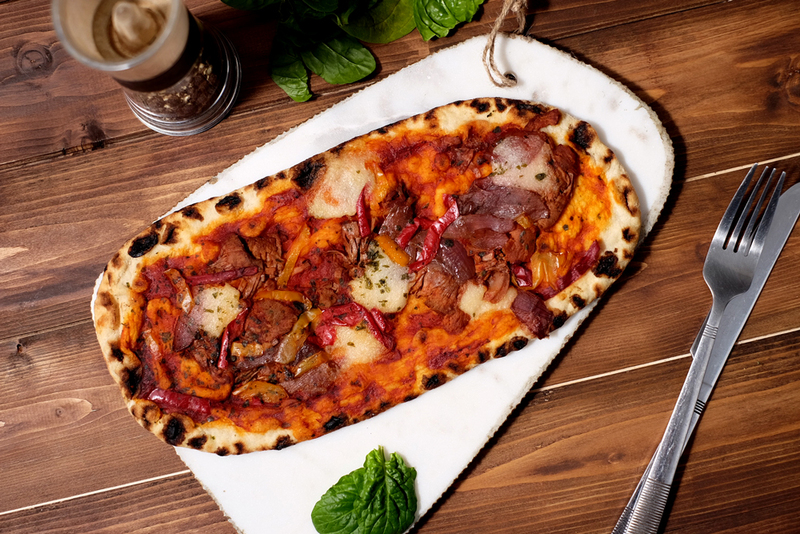 The Plant Kitchen pizzas are created with a sourdough base, which is soft and doughy in the middle and thin and crispy at the edges. So far so good! The BBQ sauce has just the right amount of tang balanced with sweetness – not sugary or sickly like some BBQ sauces can be. Then there are small circles of delicious, creamy vegan cheese dotted about the pizza. Surprisingly I loved it – it didn’t taste overly strong or dominate the flavour in any way, but gave just the right amount of subtle cheesiness. In fact, I’d go as far as to say that M&S vegan cheese is probably the best vegan cheese I have ever tasted. The jackfruit on top of the pizza is really yummy too. It still tastes a little ‘fruity’, which isn’t a problem to me as I love jackfruit. But if you’re new to jackfruit or not used to it, you might find the fruity taste a little strange. It seems that M&S could perhaps have marinaded the jackfruit in the sauce for a little longer before baking it, which would get rid of the fruity taste. The last thing I want to mention is that the pizza isn’t very big. So although I really enjoyed it, it requires something on the side, like garlic bread or fries, to completely make a full meal. I’ve always been a fan of veggie burgers made up of pulses, beans and vegetables, so these Sweetcorn & Chickpea burgers looked pretty enticing to me. Seasoned with coriander, cumin and garlic, I hoped it wouldn’t taste too much like a simple falafel. But I needn’t have worried – the burger was flavourful and savoury and the spices weren’t too strong at all. 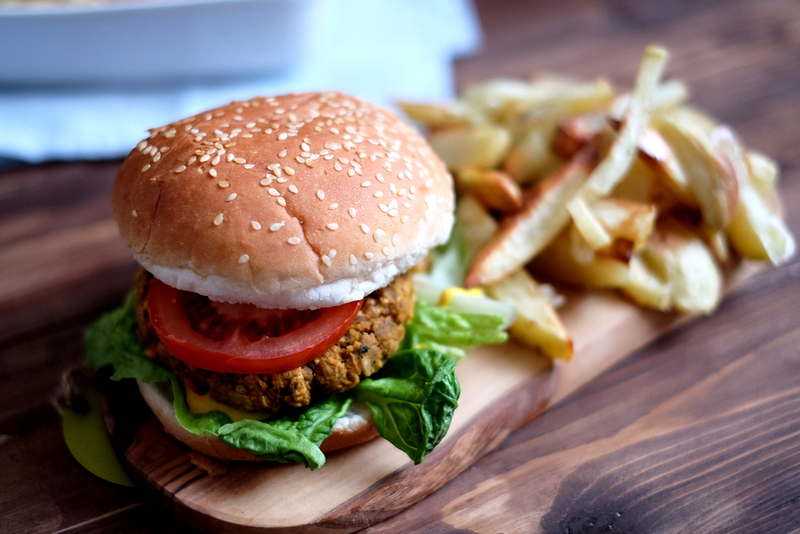 I enjoyed them on seeded buns with salad and of course my homemade oil-free baked fries. The instructions on these burgers say to pan-fry them, which is convenient, quick and easy. However if you prefer to cook without oil then baking them in the oven would be a better shout. This is how I decided to cook them; the only problem was that it dried them out a little and they also came apart a little when I lifted them off the baking tray. That could have been completely my fault though, so next time I think I will try pan-frying them to see if the texture turns out a little better. This cauliflower popcorn with buffalo sauce definitely falls into the category of vegan junk/comfort food! But ya know what? They tasted AMAZING. 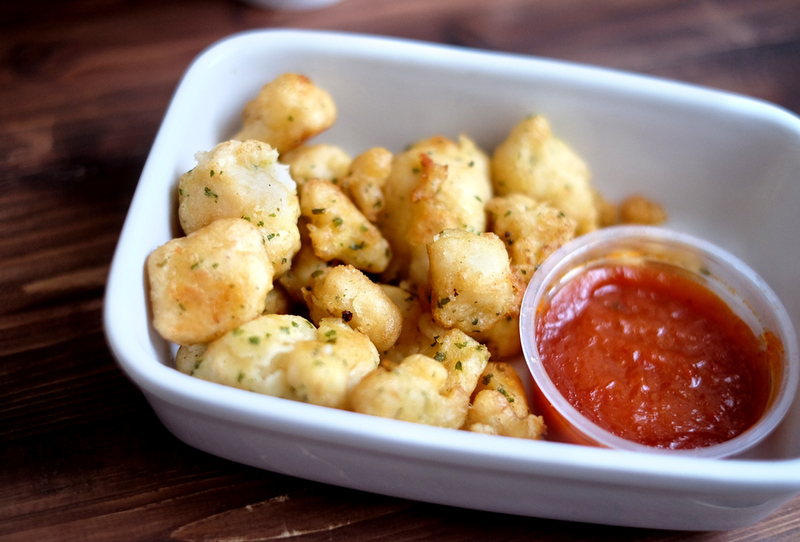 The cauliflower popcorn bites themselves are coated in a crispy seasoned batter on the outside, and are soft and tender on the inside. They don’t taste like cauliflower at all, so if it’s not your favourite vegetable, don’t let that put you off. The chilli buffalo sauce is the right amount of spicy and sweet, and not too sugary. Overall, this dish is EXTREMELY moreish, and would make an awesome starter or sharing plate with friends. That said, the box is incredibly small, and given that it’s supposed to serve two people (again), I really don’t think the price justifies the small portion. Seeing as Chris didn’t want to try any, I ended up eating this box by myself. And while that probably wasn’t the best idea, it definitely didn’t feel too filling, so it’s insanely easy to do. Overall, I’m loving the M&S Plant Kitchen range, and would certainly recommend it to anyone who is looking for yummy, indulgent, quick and convenient plant-based meals. Though these meals are pretty expensive to enjoy regularly, it’s definitely fantastic to know these options exist for when friends come over, or simply when we feel like treating ourselves. I also want to make the point that all of the Plant Kitchen range comes in 100% recycled and recyclable packaging, which is a great step on part of M&S in reducing unnecessary plastic waste. Though it certainly doesn’t solve the problem of plastic, I think more supermarkets need to be thinking about this when it comes to their ready meals and convenience foods. Hopefully this will eventually lead to the elimination of plastic entirely in the future. 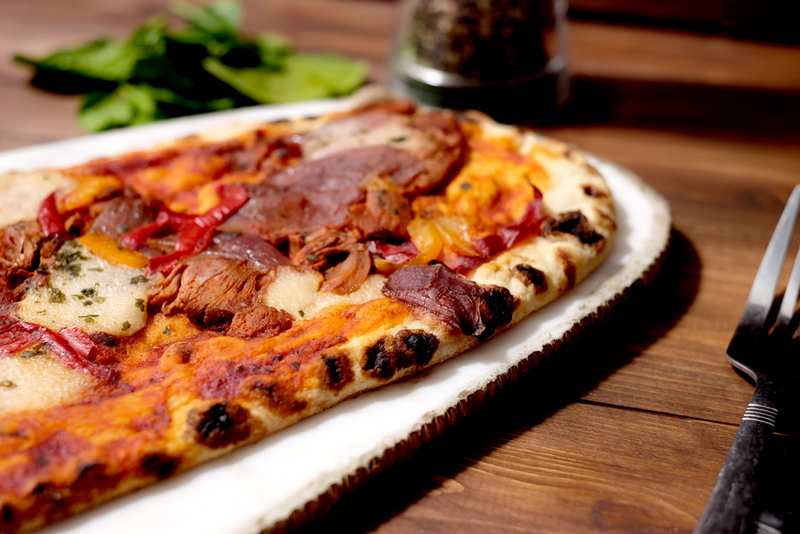 Positives: Great flavour combinations; delicious flavour; high quality ingredients; recycled packaging. Negatives: Small portion sizes; can be quite pricey. Best buys: Dirty Fries, BBQ Jackfruit Pizza, Cauliflower Popcorn. Those are all the ones I know of, but be sure to let me know if you hear of any others! What do you guys think of the new Plant Kitchen range? Will you be trying it? Drop a comment and share your thoughts below! I had the Moroccan Lentil Stew. It was so disgusting I could only eat a couple of spoonfuls. It had nothing Moroccan about it and tasted like bad convenience food! Sorry to hear you didn’t enjoy that one 🙁 I’ve never had the Moroccan stew one before but I do feel that the ready meals are the weakest of the range. I’ve just had the cauliflower popcorn and thought it was awful. Been a vegetarian for over 30 years never tasted anything so bad. Oh really? Sorry to hear that. I guess it depends on what sorts of flavours/textures you enjoy. I think the cauliflower popcorn is ideal for those wanting to sate a salty ‘deep fried’ sort of craving and I didn’t think it tasted too strongly of cauliflower either. If you don’t like cauliflower though it may not be your bag!